Create your most striking look ever in this stunning color full-length dress. This dress features a v-neck, surplice neckline that flows into a fitted waist and three quarters sleeves . 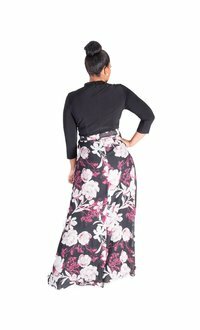 The skirt of the dress has an a-line silhouette with inverted box pleats and a hemline that ends just at the ankles. Add your heels and glamorous clutch and accessories from our collection to complete your look.